I'm turning 30 in a few weeks and I've totally dropped the ball on my "30 before 30 list". Like I'm scared to even share it again here because I really failed big time. BUT let's get real, I might have dreamed a bit bigger than my life allowed for the past year. So, I figured since I didn't go swimming with sharks and climb Mount Everest (ok, those weren't actually on the list), there was something simple I could do. I could give back in a way that would make a big difference for someone else. 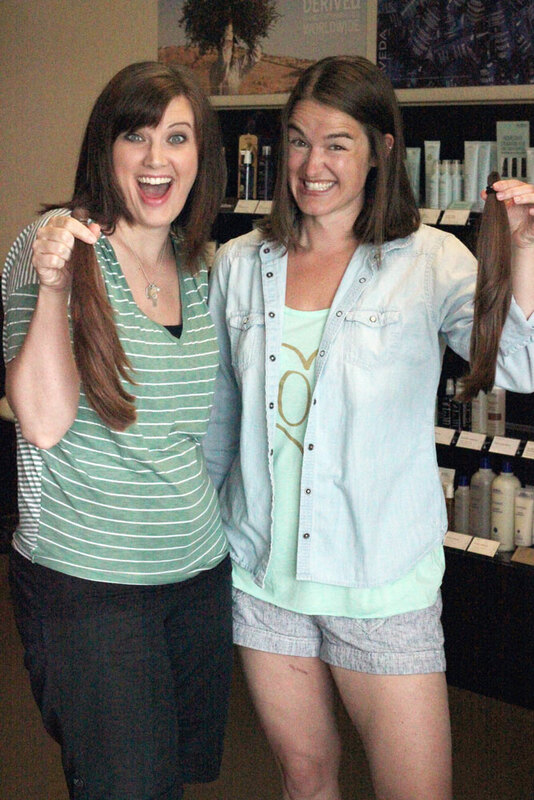 My sister in law and I are only 6 weeks apart in age, and since this was our summer of 30, we decided to chop off our super long hair and donate it to Locks of Love. While we were on family vacation together last week, we made a hair appointment and went for it! 22 total inches of hair we donated and it feel so good to make a change and make a difference. The night after we cut it off, we were at the mall and I saw a mom with a head scarf on, chasing her small children, and you could tell she was battling cancer. It took everything in me not to cry and run over and hug her. Knowing something as simple and easy as chopping off my hair might help someone like her feel a little more beautiful, it's more than worth it. I'm thrilled with how it turned out, and I'm excited for a much cooler cut for the summer! Here's to a fun change for the big 3-0!! !